It may be time to cut Gwyneth Paltrow some slack for her food stamp faux pas. Her less than $29 grocery store haul of mostly greens, brown rice, and limes was widely mocked on Twitter. Others expressed concern that her low-calorie finds would restrict her to consuming a scant 1,000 calories a day. In a detailed account published Thursday on Goop, Paltrow admitted she caved around Day 4 of the challenge. But others, including politicians, have also struggled with the Food Stamp Challenge. The Hollywood starlet and founder of lifestyle company Goop has often taken a lot of heat for her nutritional choices, which many criticize as being unattainable. Many of the recipes on Goop look like they’re straight out of some Food Mecca but can also be pretty complicated, requiring dozens of ingredients and multiple steps. Not many Americans have the time, money, or patience required to live the true Goop lifestyle and subsist on kale quinoa breakfast bowls and thai strawberry soup, which is part of the reason why Paltrow’s experiment in below-the-poverty line dining became such an easy target. But many before Paltrow — politicians, journalists, non-profit workers, students — have tried the Food Stamp Challenge. And many, like her, had their fair share of missteps. The thing is, living on $29 a week is hard because it’s supposed to be hard. Here’s a look at some other Food Stamp Challenge participants who could have done some more pre-planning before hitting up their grocery store. If you thought limes, kale, and brown rice sounded like an odd shopping list, try grocery shopping with Rep. Tim Ryan. According to The Washington Post, Ryan “seemed to grow visibly depressed as he realized the limits of his budget” and loaded up his grocery cart with peanut butter, jelly, bread ... and cornmeal. That’s right, cornmeal. It’s true that many of us in highly stressful, dire situations are known to panic and make seemingly irrational decisions. To be honest, if I was in Ryan’s shoes and a Washington Post reporter was following me and scrutinizing my purchasing decisions, I would totally bow under the pressure and blow my $29 on nutella and avocados. But cornmeal, seriously? Ryan also (thankfully) nabbed some tomato sauce and pasta. “I don’t know if this is going to make it,” Ryan told the Post, and predicted he’d be eating cornmeal and strawberry preserves by the end of the week. 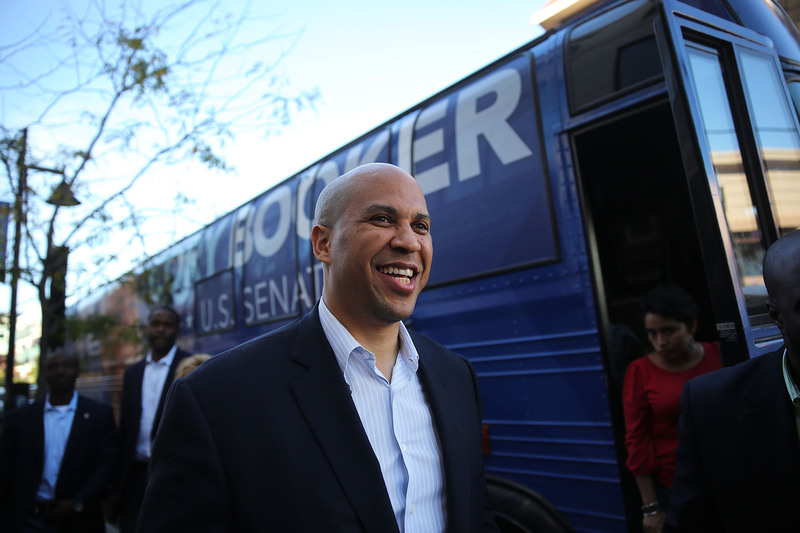 On his first few days on the Food Stamp Challenge, then-mayor of Newark, New Jersey, Cory Booker seemed to be all like, “I totally got this.” He spent his meager food allowance on a selection of pretty hearty but economical foods such as sweet potatoes, black beans, and salad greens. But then the low-point of Cory Booker’s Food Stamp Challenge happened on his sixth day, when he burned one of his sweet potatoes and realized he couldn’t afford to toss it and had to eat it anyway. After six days of subsisting on mainly ramen and bananas, Senator Chris Murphy (D-Connecticut) dropped several pounds and was experiencing headaches from caffeine withdrawal. Murphy told The Hill he had cut coffee out of his diet because it was too expensive. As someone who subsisted on ramen for most of my sophomore and junior years of college, I can attest to this: Ramen has roughly the same nutritional value as a plastic bottle. And if ramen is difficult for even most college students to digest, it's easy to imagine how hard it must be for a full-grown member of Congress. But no coffee? It's called the Food Stamp Challenge, Senator, not the Life Challenge! Donny Ferguson, an aide to Republican congressman and Food Stamp opponent Steve Stockman (R-Texas) decided to do the food stamp challenge as a way to prove to Democrats that living on a few dollars a day isn’t so hard after all. Ferguson bragged that he was eating well on the meager budget, subsisting on red beans and rice and popsicles. But then Ferguson encountered an unplanned obstacle. Ferguson’s solution? He ended up caving and buying a $9 lunch at the airport. Needless to say, that was way, way, way over-budget.